I saw this unique card called Double Dutch Fold on Beate Johns' blog and had to try one. 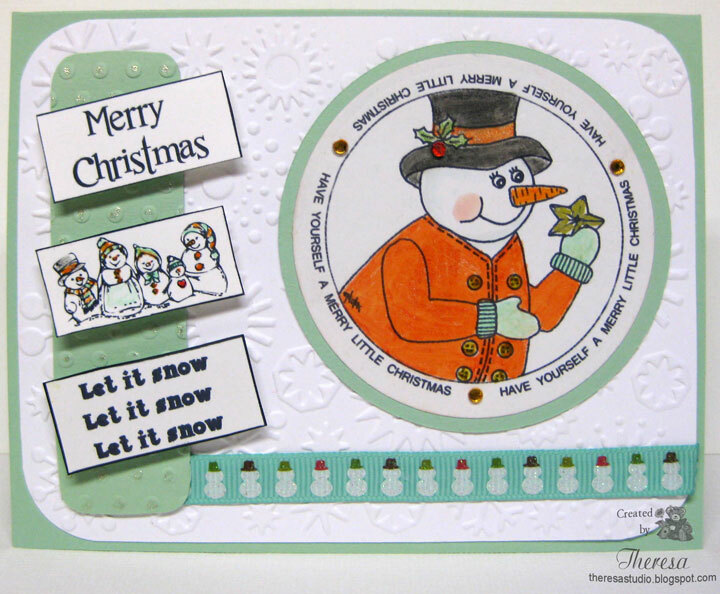 I used a digi "Up In Arms" from Sassy Cheryl for the top fold and colored the Snowman with Copics and markers. I cut the image with Spellbinders Labels 4 die. 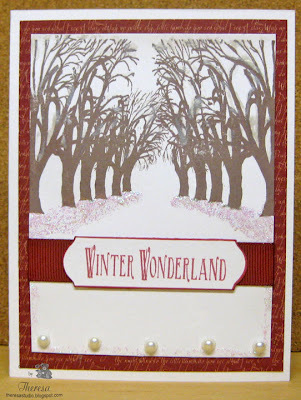 The card base is GKD Moonlit Fog and Pattern papers are from BasicGrey Jovial Paper Pad. Used a unknown sentiment stamped in Memento Rhubarb Stalk below upper fold which holds the card closed. (One side is attached with a dimensional and the other side has velcro so card opens easily). 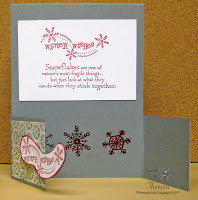 Stamped inside with some snowflakes and sentiment from Flourishes "Warm Winter Wishes" set. Photos show upper flap up and inside card. 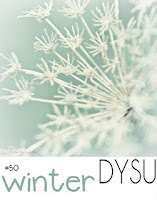 Digital Tuesday Challenge: Theme is winter wonderland. BasicGrey Challenge: Anything Goes. Used Jovial Paper Pad. One Stop Craft: Theme is Winter Wishes. 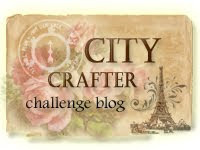 Secret Crafters Saturday Challenge: Anything Goes. 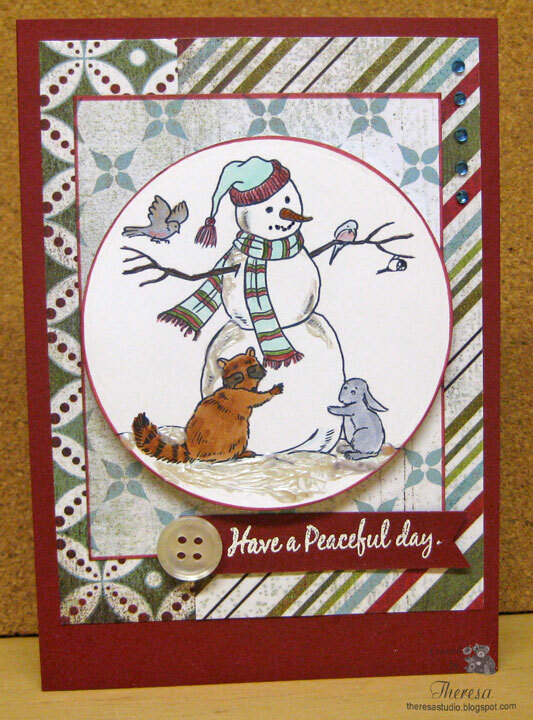 Craft Your Day Away: Challenge is Snowmen. Thanks for stopping in to visit. I truly appreaciate all your comments. This week, Speedy the Cat's Friends Challenge #87 is "Anything Goes". That is easy enough. 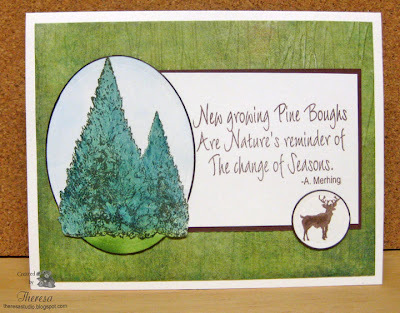 I decided to use one of their new stamp sets that I won recently and used a sketch from the challenge at The House That Stamps Built-Repeat Impressions Blog. Papers: Ivory CS,Brown CS Scrap, Teresa Collins' "World Traveler"
If you have been wondering what I 've been doing instead of blogging, I cleaned up my Studio and organized my supplies, stamps, scraps, etc....hope to use more of what I have in 2012. Guess that is a New Year's resolution. Also I organized to make room for my toys that Santa brought including the Spellbinders Grand Calibur and Grand Dies. Also expecting the Cricuit Machine that I won at Sugar Creek Hollow. I am a lucky girl!! Thanks Santa. 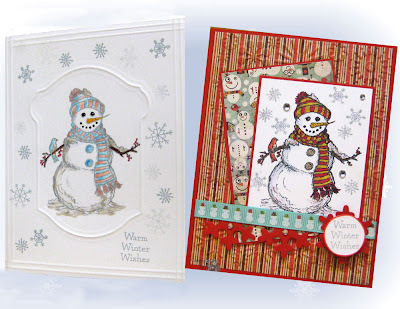 This month, Flourishes Christmas Spirit Challenge is to create a Christmas card with Santa in mind. 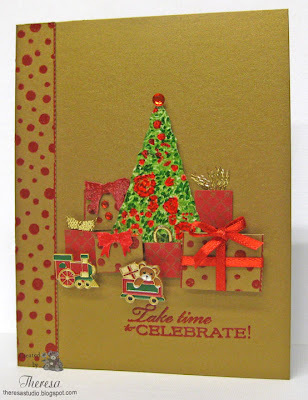 Use St. Nicolas’s image, presents, anything that has a little Santa flair and use Flourishes stamps. Five lucky winners will get the set called Santa I Believe. I really want and need this one!! I have been entering nearly everyone of these challenges this year but this one was a little difficult for me because I do not have any Flourishes "Santa" stamps in my collection of Flourishes stamps. 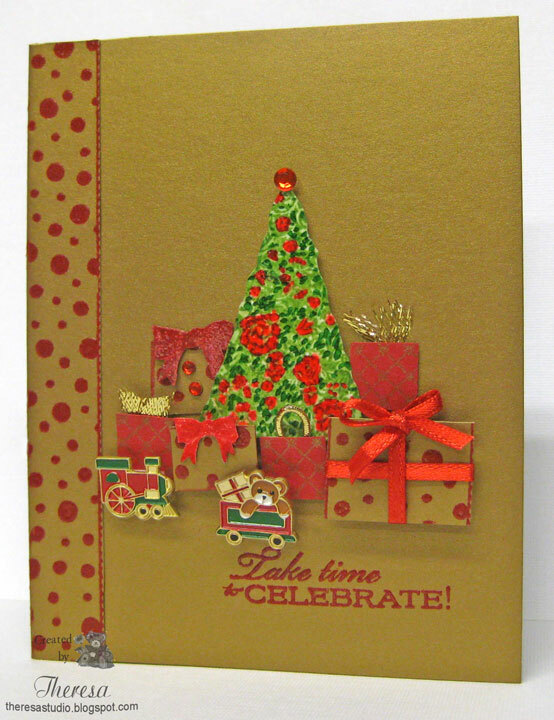 For this challenge, I decided to center my card around presents from Santa and be a bit creative in using several Flourishes stamps to make my card. I began using a tree stamp from "Birthday Pennants" to create a place for all the presents that Santa brought. I created the presents with stamps from "Strips and Stripes" (a border) and "Alleluia Angel" (a Grid Stamp) and added bows stamped with "Poinsettia and Boxwood". Also added ribbons to some gifts. Under the tree I attached two metal buttons as toys under the tree. Added all these items in layers with dimensionals to give a 3-D effect...hope it shows in the photo. I finished the card with a border of dots using "Strips and Stripes" and a sentiment from "Moments in Time". Our Creative Corner: Home for the Holidays-use a scene in your home with some glimmer and sparkle. My presents under the tree were wrapped in red and gold and I have a wagon with a Teddy Bear sitting underneath. Wishing you the best in the New Year! Thanks for stopping by. I love to read all your comments. Taking time out to post a card for some challenges. I used this digi "Back to Nature" by Phindy. I colored the image with Copics, cut with Nesties circle die and added some Stickles for snow. Edged with Memento Rhubarb Stalk Marker. 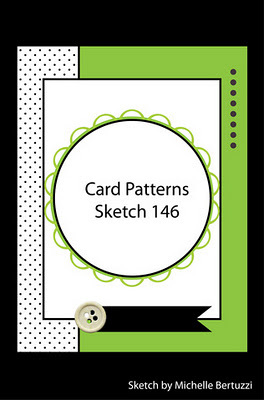 Used scraps of BasicGrey "Figgy Pudding" to make a background and designed layout using Sketch from Card Patterns. Stamped sentiment from Mark's Finest Papers with Versamark and Ranger Seafoam White EP on free cut pennant. Added button and rhinestones to finish. Phindy's Place Challenge: Use your SCRAPS... pull out all those little bits and pieces of paper that are leftover from other projects. There's Magic in the Air: Challenge is anything goes with style or design, BUT your image has to incorporate a bird of some type. 3 birds on my card. 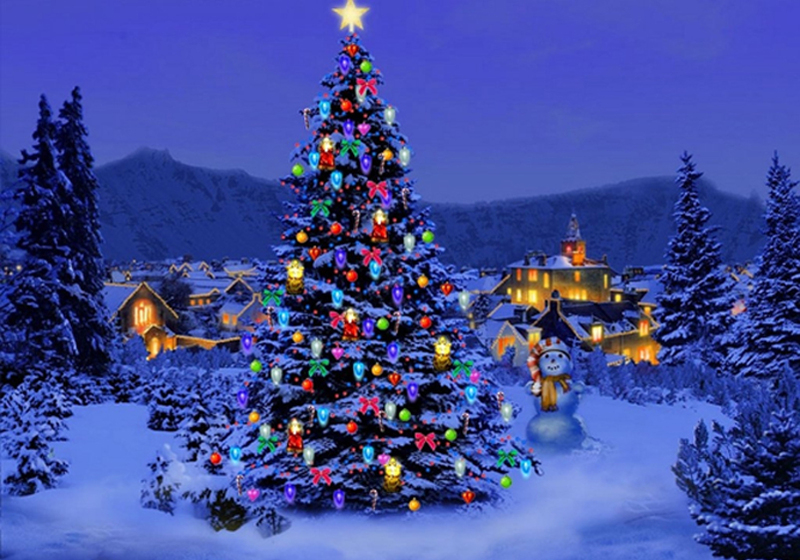 Christmas is almost here...shopping done....menus planned...baking tonight. I just love this pine cone image from Mark's Finest Papers "Greetings of the Season". 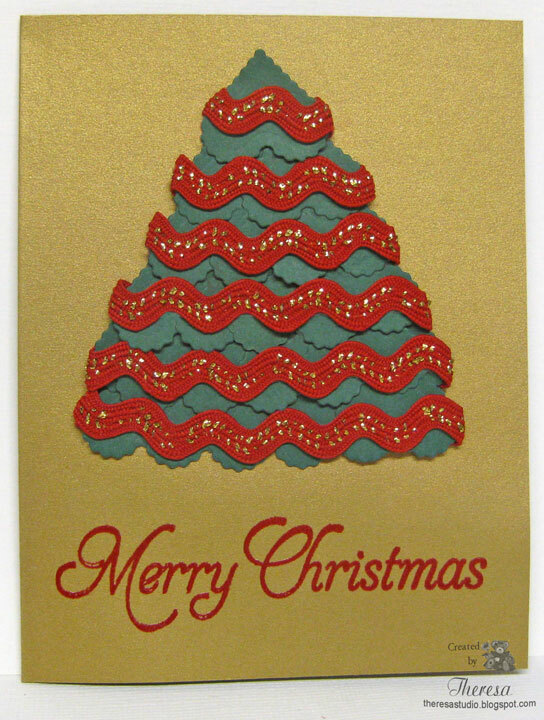 I thought this would make a simple card using some ribbon with a pine cone theme from Joanne's. Using a lovely sketch from WHAT IF? Wednesday challenge, I created this card. Papers: GKD White, All Spruced Up. Metallic Gold from scraps. Welcome. 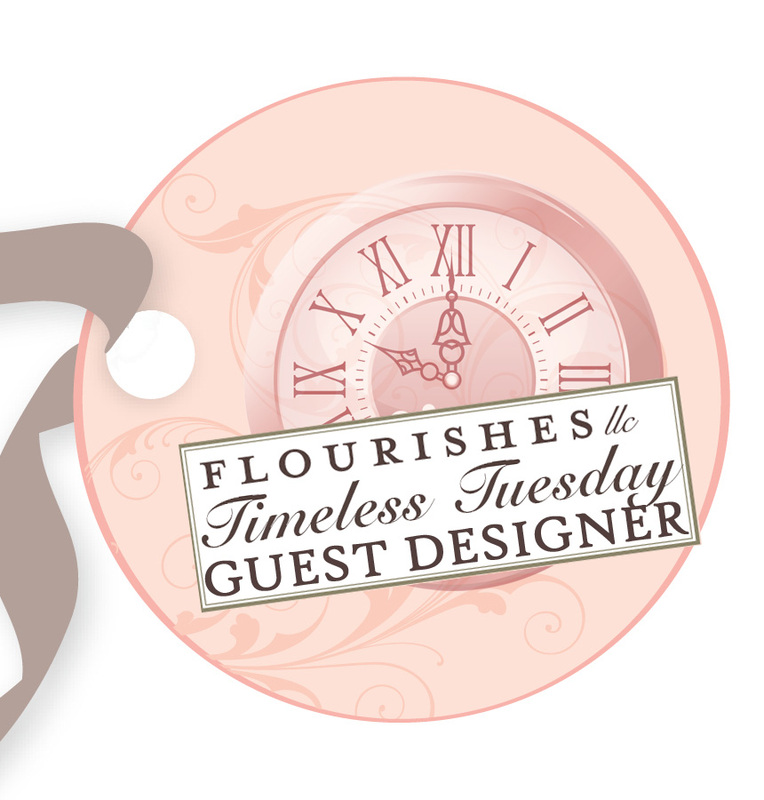 This is my third and final week as Flourishes Timeless Tuesday Guest Designer. I have had so much fun and thanks to all the Design Team for being so friendly and having me as a part of their talented group. This week Beate is the hostess, and the challenge is to use the Telescoping Image technique. "Stamp your image two or three times (I did four) and cut it smaller every time for a layered look." Check here for a great tutorial by Beate. I have never used this technique but I always enjoy trying something new! This card, using one of my very favorite Flourishes Sets "Zinnias", is my thank you to the Timeless Tuesday DT. I stamped the bouquet image four times on White Card Stock with Memento Tuxedo Black and then cut in graduating sizes with circle dies. I colored the image with Copics, Glaze Pens, and added Glossy Effects to the bowl. 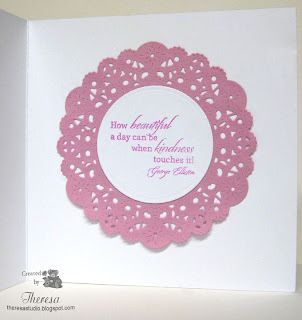 On the white card base, I layered an embossed mat and attached a Pink Doily. I embellished with a double layer of ribbon and placed the telescoping image (assembled with dimensionals) on the card. 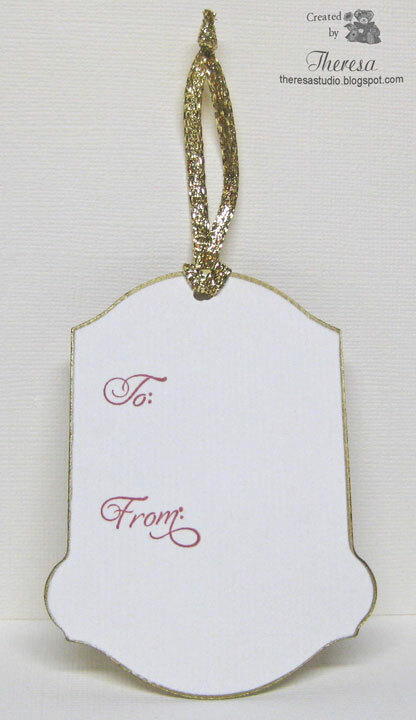 I finished with a sentiment tag on a loop of ribbon and a bit of bling. I also did the inside simply with a doily and sentiment. See photo lower left. There will not be a Timeless Tuesday challenge on December 27th next week. Thanks for coming by. I am not sure about the inspiration for this card but I was trying to tie in with a challenge that required using hearts and this was what I came up with as a design. 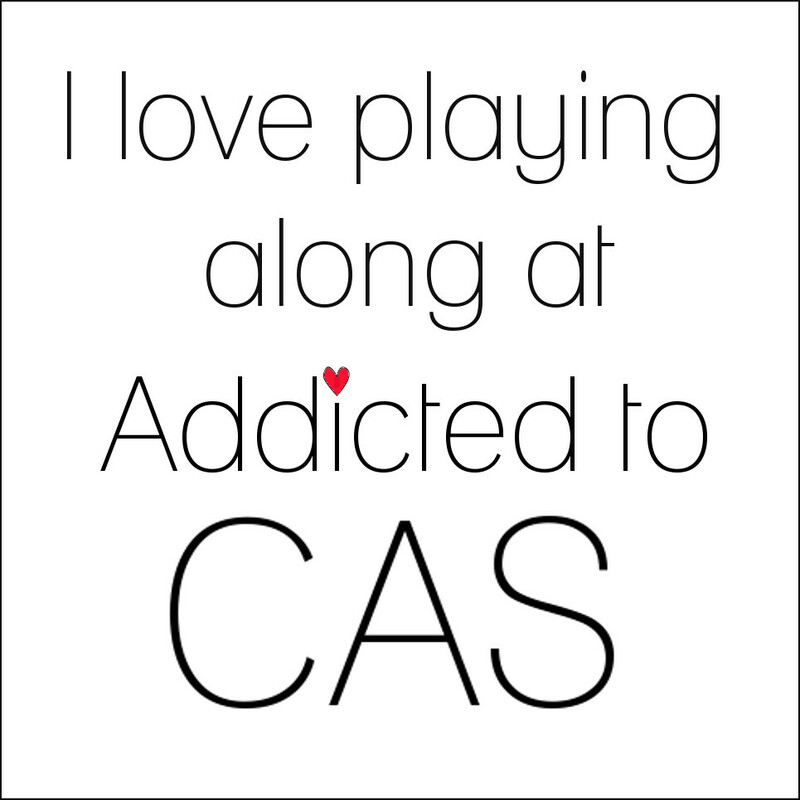 I punched several hearts from Green CS with the smallest die in Nesties Scalloped hearts.....did not keep count of the number of hearts used. I arranged the hearts to create the tree and glued together. I then randomly attached strips of red ric rac woven with gold threads that I had in my stash from Joann's for a long time. 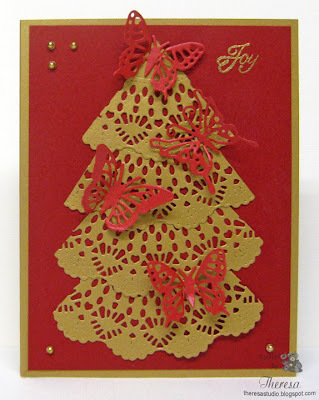 The tree was mounted onto Gold Metallic CS and a sentiment from AnnaBelle's "Stamped for Christmas" finished the card....heat embossed with Versamark and unknown Red EP. This was a quick last minute Christmas card to make in case I need another one. 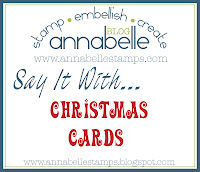 Annabelle Stamps Challenge: Say it with ...Christmas Cards. For Fun Challenge: Christmas- Anything Goes. Second entry. 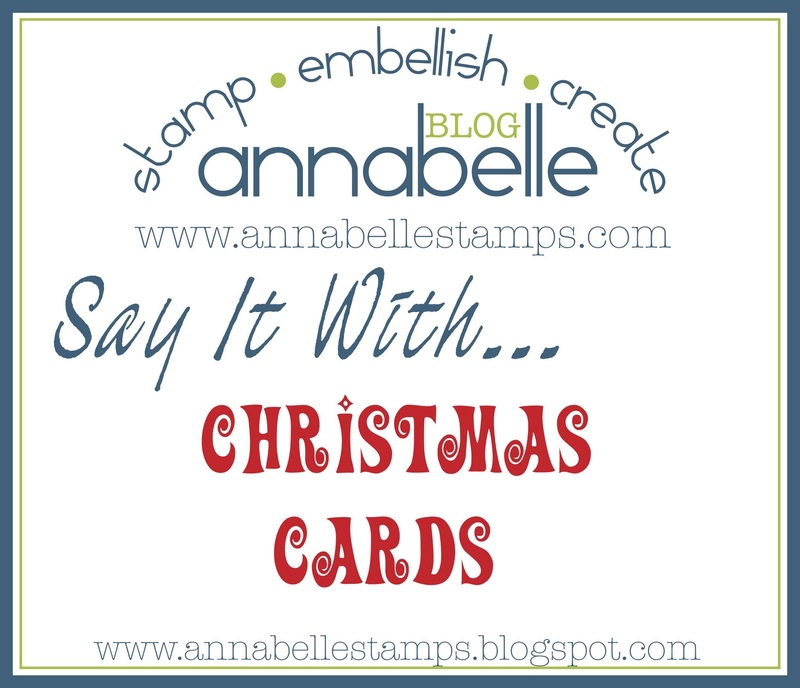 Christmas Cards All Year 'Round: Christmas -Anything goes. 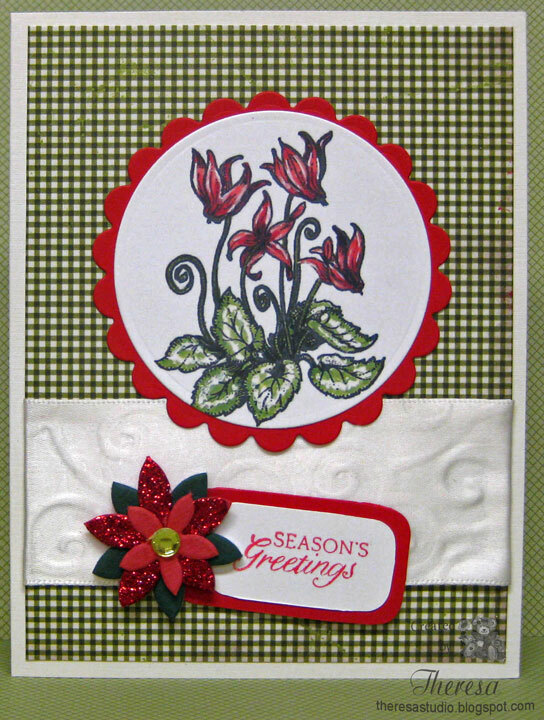 Joan's Gardens Challenge: Create a quick Christmas card, something that does not take long, perhaps using dies or stamps. Crafty Ribbons Challenge: Traditional colors for Christmas. 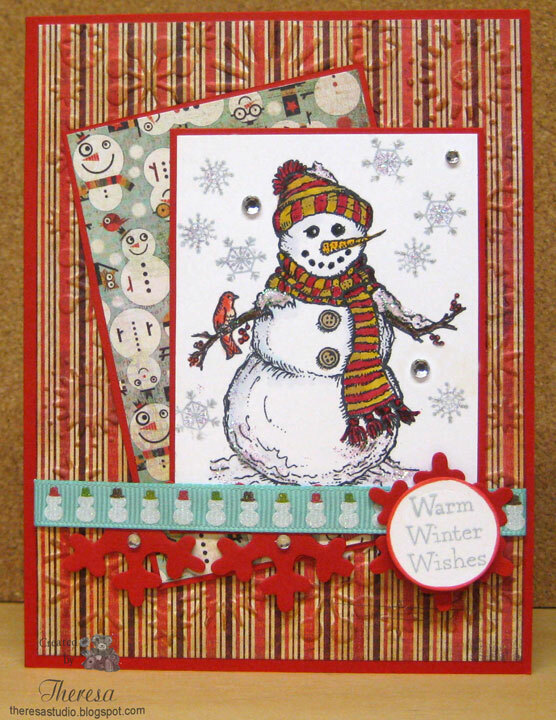 Paper Cutz Challenge: Challenge #119 is "All Hearts Come Home for Christmas!" Make a card, LO or craft project for Christmas using hearts, and any colors you'd like! This was my inspiration to design with hearts. Just a little baking and little more shopping to do and I'll be ready for the holidays. Morning...we had some snow yesterday so I am inspired to make a snowy card. 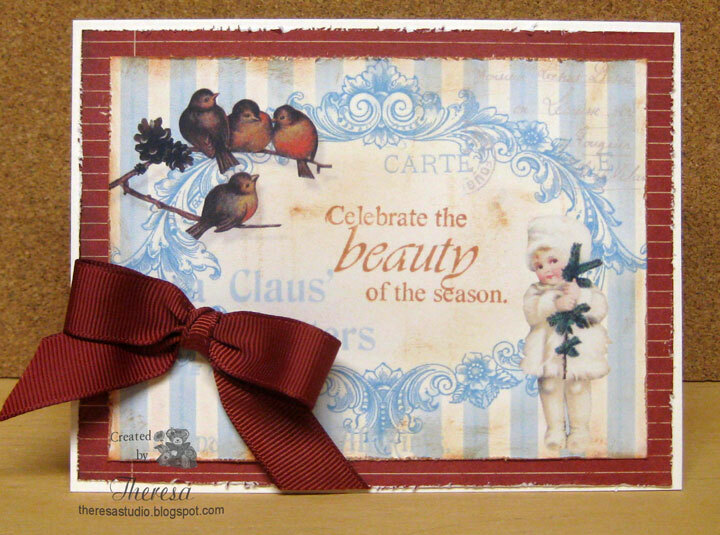 I used digital images "A Merry Little Christmas" and "Christmas Tickets" from Paper Cupcakes. I colored the snowman with pencils and OMS, Copics B0000 and R20, and used a Sakura Orange glaze pen to highlight. 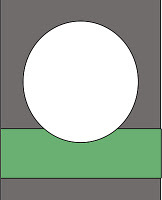 Cut the image with Nesties circle die and matted with a circle of Green CS. Used the same Green CS for the base and attached some white CS embossed with Cuttlebug EF Snowflakes. 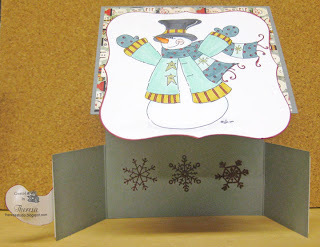 Assembled the rest of card with the tickets, scrap of the green CS, and snowmen ribbon from American Crafts. Added some Red and Gold Rhinestones from my stash. Think I like the colors that I pulled from the ribbon and challenge graphic. There's Magic in the Air: Winter Fun with Bling. Nina challenged us to use an image reflecting some winter fun such as sledding, ice skating, a snowman, etc. 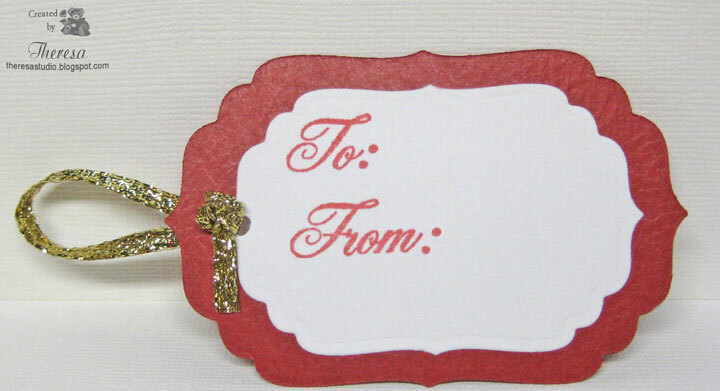 Then add some bling to your card/project. The ABC Challenge: F is for Frosty. Paper Pretties Monday Challenge: Use ribbon. For Fun Challenges: Christmas theme-anything goes. Do You Stack Up Challenge: Show winter projects. Color graphic must have inspired my color choice? 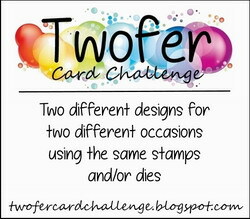 I have another card to enter in hopes of winning Flourishes Stamps from their latest release which are just beautiful. 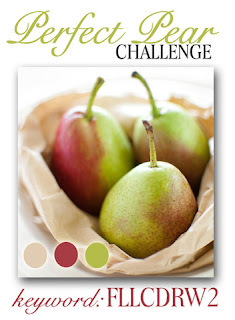 Perfect Pear Challenge is to be inspired by this photo and to use the colors in it — a light green, deep rose and tan. I chose to use a stamp from Flourishes "Wreaths of All Seasons" and a sentiment from "Taglines". I began by stamping the wreath on white card stock with Memento Rich Cocoa and colored it with Copics R83,85, E0000, Green pencil, Distress Ink Crushed Olive, and Memento Pear Tart. I cut the image and pink mat with Nesties circle die and attached to a green mat cut with Lacey Circle Die. Base card of GKD Sand CS was layered with white CS wrapped with a double ribbon and embellished with pink rhinestones. Sentiment stamped with Memento Rhubarb Stalk on Sand label cut with Spellbinders Ribbon Tag (modified size). 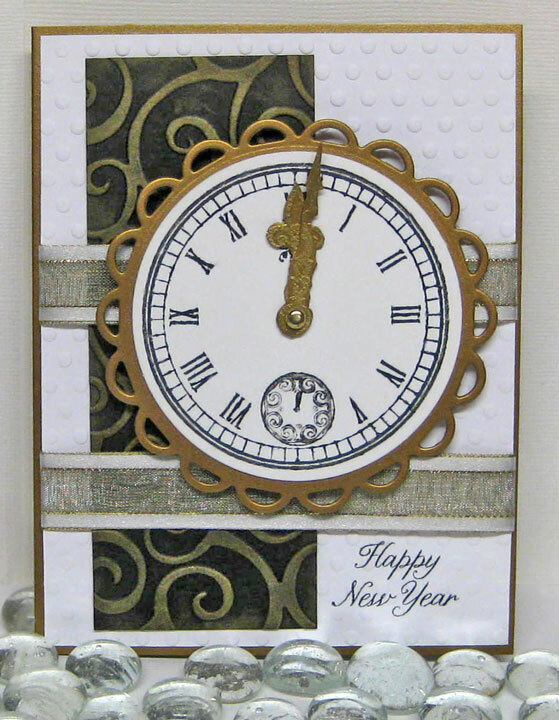 The noon time Night & Day Challenge at Flourishes is to showcase a day or night scene in your card or creation! Just that simple — maybe you add a little sunlight or pick a scene that looks like day time. Or, you add the glow of moonlight or make a background that looks like the night. You could also use the colors of day or the colors of night as your inspiration! I decided to create a day time scene. I used the stamp set "Spring Has Sprung" and stamped the bunny set with Memento Tuxedo Black and colored with Copics R20, C00, 01, G21 and Sakura Glaze pens in Yellow, Blue, and Green on White Card Stock. Sponged the sun with Memento Dandelion and the sky with Memento Summer Sky. I attached this to an Embossed Yellow Card Stock Mat (Cuttlebug EF Divine Swirls) and then to the the base of White Card Stock. Stickles was added to the bunnies' tails and noses. Lace, pearls and flouncy ribbons – these are the things that make up a creation with a truly feminine flair. 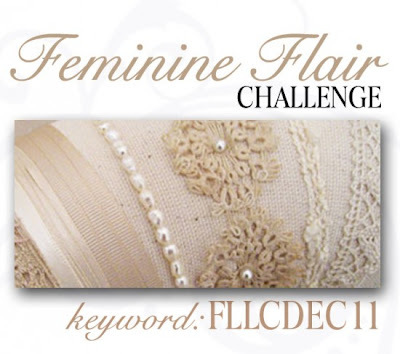 That’s what is at the heart of Flourishes month’s challenge Feminine Flair. 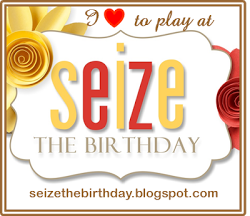 To enter, use a dose of femininity to your cards or creations! The winner will receive the entire December release. For my card I have used a lot of pink...a very feminine color. I used the stamp set " Cherry Blossoms" stamped on Flourishes Classic White Card Stock with Memento Rich Cocoa and colored the image with Copics R81,83, G21, E25. Used Sakura Pink Glaze pen for highlights. 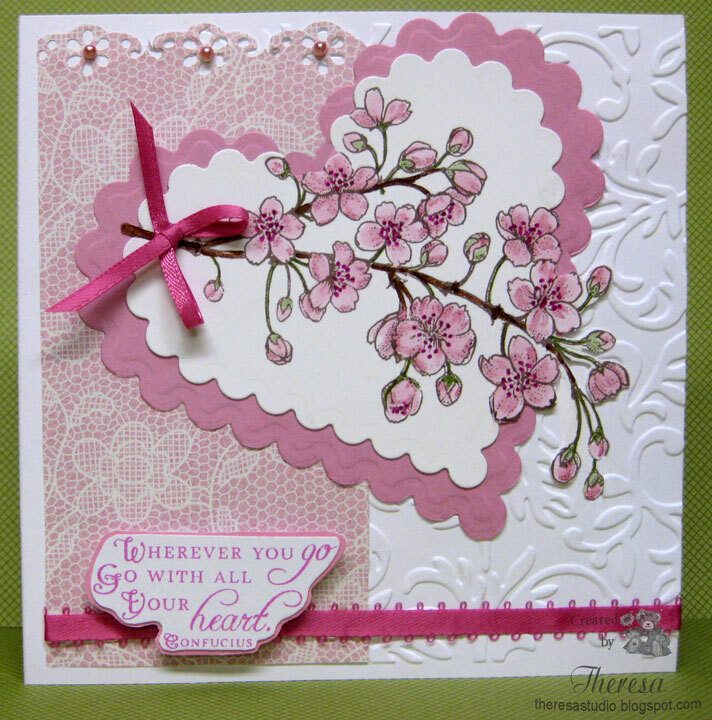 I cut this with Spellbinders Scalloped Heart Die and placed on a Mat of pink card stock cut with the same dies. I placed this on a background of Lace Pattern Paper and a white card stock base embossed with Cuttlebug EF Victoria. Used Martha Stewart Floral Lace Border Punch and added some ribbons and pearls (colored with Copics) from my stash. Finished with a sentiment stamped in SU Pixie Pink. I think this is a very feminine card. Hello. It's my second week as the December Guest Designer for Flourishes Timeless Tuesday. Our challenge this week is brought to us by our hostess Makiko. Her challenge is Opposites Attract! She is asking us to "Use the same image and make two cards/projects with two totally different looks, styles, themes or colors. For example, you can make one card CAS and one with lots of layers, one feminine and one masculine, monochromatic and lots of colors, for a child and adult, for birthday and sympathy, etc. Anyway you think they are totally different or opposite." 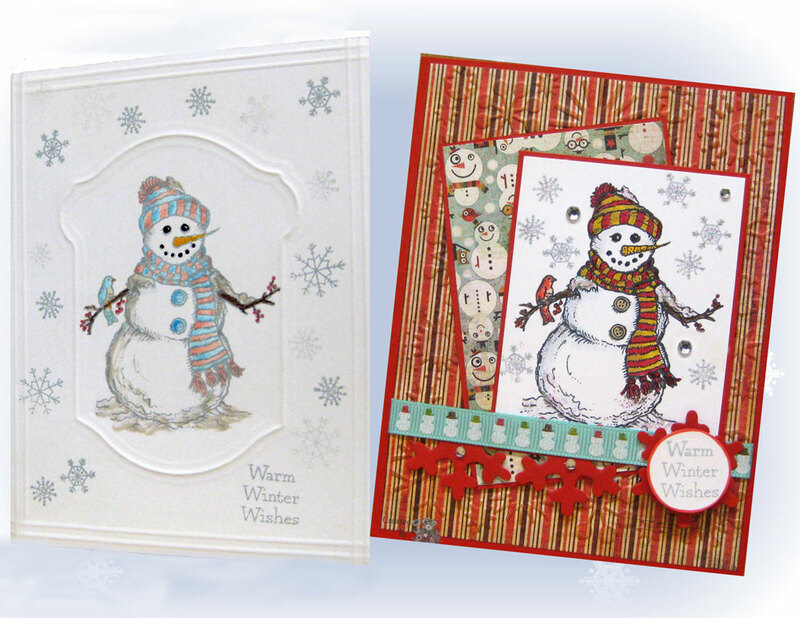 To make my two totally different style cards, I decided to use the Flourishes stamp set "Warm Winter Wishes" as it is very cold here in Ohio and we are thinking about snow. 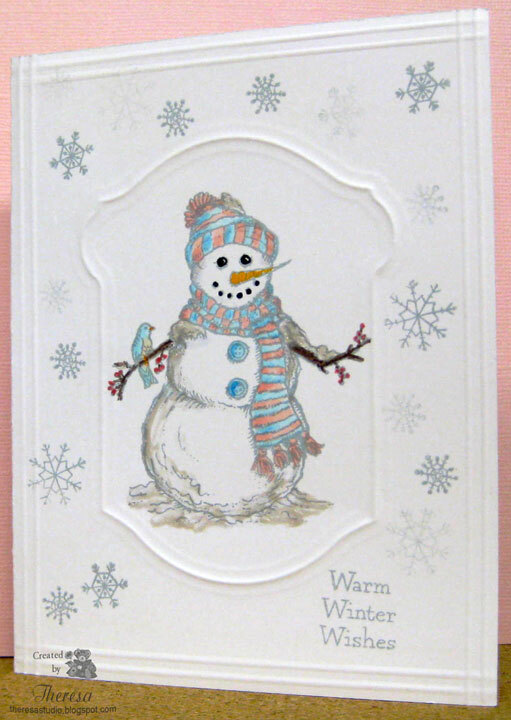 My first card I made with the Snowman image is a very Clean And Simple (CAS) card. I made it one layer ...that's as simple as it can get! 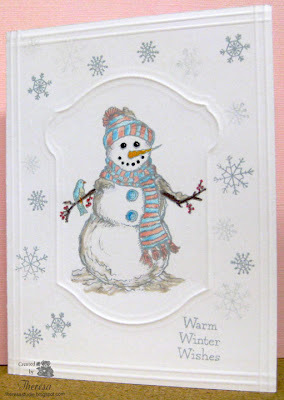 I stamped the snowman directly onto white card stock and used a die to give an embossed design around the image. 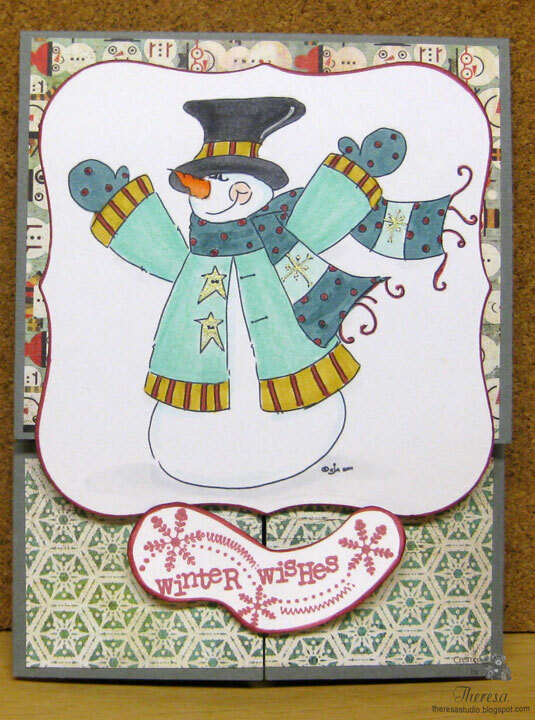 Colored the image with Copics ( pastel theme used) and stamped on some snowflakes and the sentiment. I scored some lines on the edges to give a bit more texture. Added some white stickles to finish. Now for my second card, this was definitely not a CAS card. 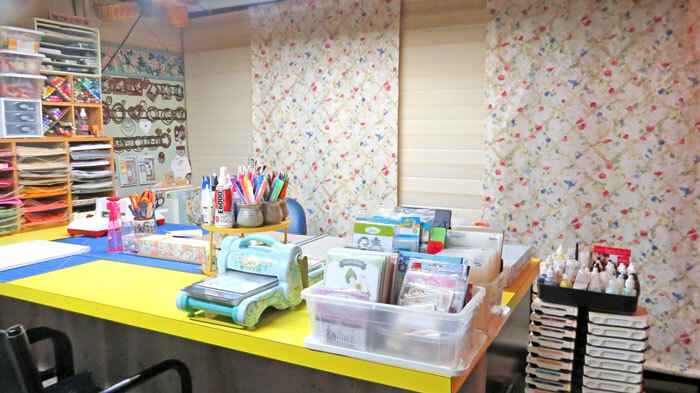 I used lots of layers, pattern papers, a bright color theme, and embellishments. I used the sketch from The Sweet Stop blog as inspiration for the design. 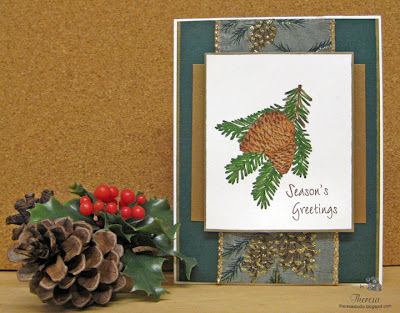 Stamps: Flourishes same as first card "Warm Winter Wishes"
Check out what the Timeless Tuesday Team has created for this challenge. Everyone can PLAY and anyone can WIN! Each week Flourishes draws one lucky name for a $10 gift code to the Flourishes store! Flourishes Bring Back Beautiful: The Beauty of Winter-open to a holiday or winter themed creation. The Sweet Stop: Use the sketch shown below. Thanks for droppng by. 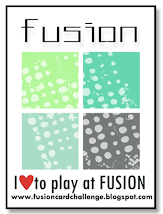 I hope you decide to play at Timeless Tuesday this week. I have another entry for Sugar Creek Hollow's challenge to make CHRISTMAS CARDS IN NON-TRADITIONAL COLORS. 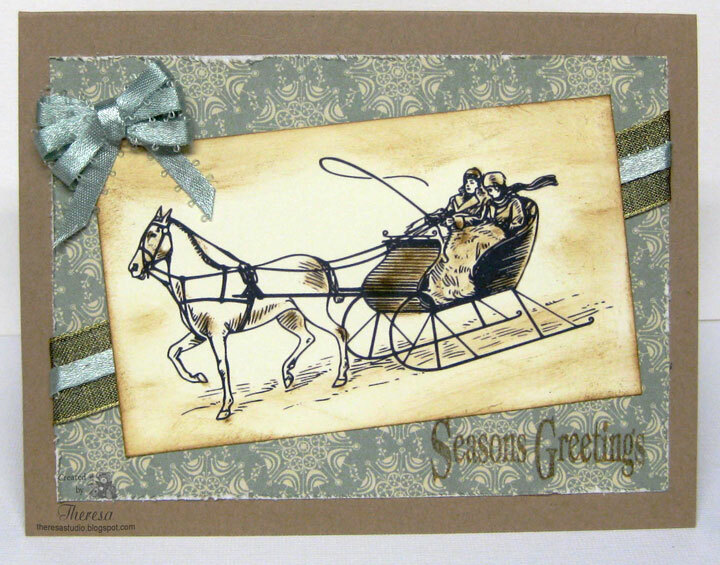 For my card I am using a vintage digital image that I downloaded from Create with TLC called "Sleigh Ride With You". I printed this on GKD CS and distressed with Distress Ink Tea Dye . Instead of coloring the image, I just added some highlights to the image coloring with the Tea Dye ink. I placed the image on a mat of paper from Webster's Papers "Waiting for Santa and Sweet Season". Matched the color in the mat with some aqua blue satin looped ribbon for the bow. Also added some gold metallic ribbon layered with the aqua blue ribbon uder the image. 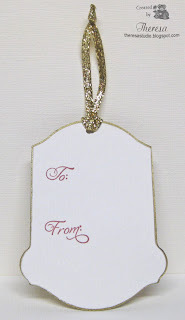 Stamped a sentiment from Creative Vision "Holiday Sentiments" with the Tea Dye ink. Used kraft CS for the base. DYSU Challenge: Use Something Old! It could truly be something old, or just a vintage style or image. Used vintage look. Bearly Mine: Untraditional Christmas- use no green or no red.on a Christmas card. 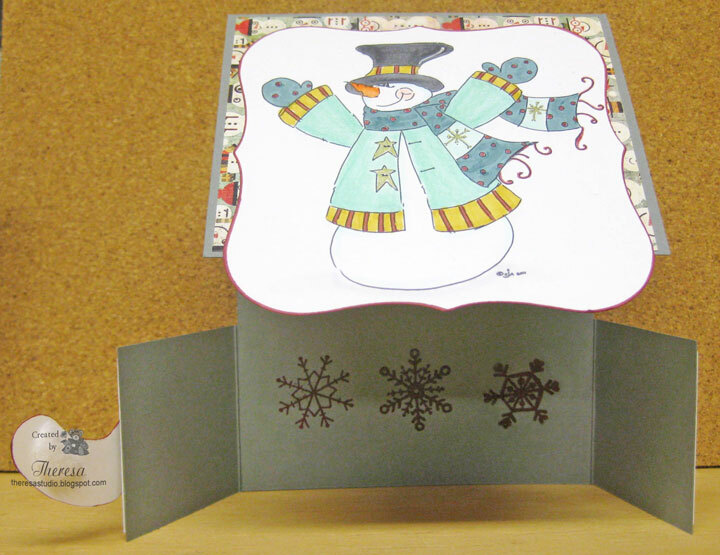 Sugar Creek Hollow's challenge this week is to make CHRISTMAS CARDS IN NON-TRADITIONAL COLORS. For my card I am using a Vintage postcard design that I downloaded but failed to identify the source...hate when I do that as I always try to record the source. I just love the color blue and color of the birds and thought it would make for great non-traditional colors. Used a mat from Authenique "Wonder" paper pack on a base of GKD Ivory CS. Distressed the edges and added some distressing with Distress Ink Tea Dye to the image. Stamped a sentiment from GKD "Festive Frame" on the postcard with Tea Dye ink. Added a bow of Rusty Red Grosgrain Ribbon to finish. I am pleased with this vintage look. I just had to play with a new stamp set from Mark's Finest Papers that I recently won. It is "Ice and Snow", a December release. 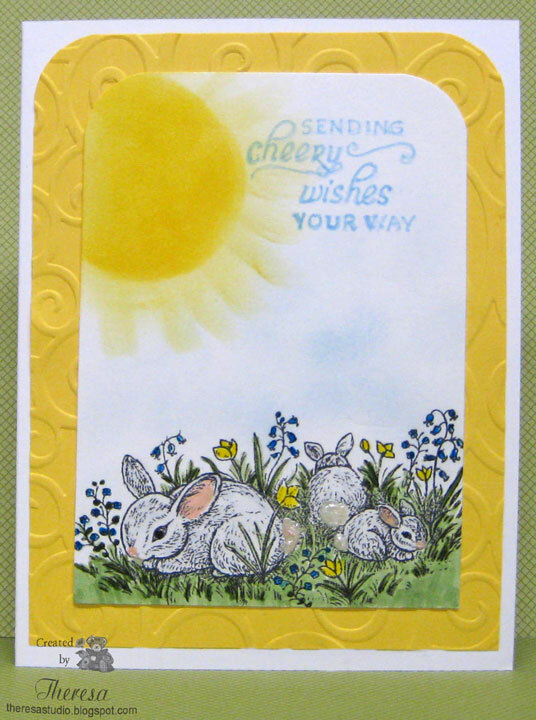 This card was made for the Speedy the Cat's Friends challenge to make a card using your favorite embellishment suggested by Brenda! Sounds easy enough? Well, not when you have so many embellishments that you like. I love gems of all kinds, especially pearls, and ribbons are so fun to use....so settled on these two to use. Stamped the trees with Memento Rich Cocoa and added 2 kinds of stickles (another fave). Stamped the sentiment with Memento Rhubarb Stalk, cut out with Spellbinders Word Window and attached onto the ribbon. Card Base is GKD White CS same as the image and mat is from Webster's Pages. Added pearls....thought of coloring with a red Copics but left since they are the color of snow. Hope you can see the snow (stickles) on the tree branches. Loving this new stamp....so great for winter cards. Saturday Challenge Secret Crafters: Photo Inspiration shown lower left. I was inspired by the Red Butterflies in the photo. 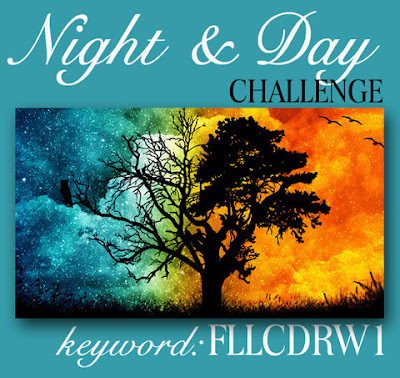 Flutter by Wednesday: Open challenge. Included butterflies. ABC Christmas Challenge: Y is for Yipeee. Christmas is almost here. "Anything Christmassy Goes"
Papercraft Star Challenge: Challenge 74 is to use a tree ...See Photo inspiration lower right. Red and gold stands out in the photo. Cooking It Up With Katie: Anything Goes. 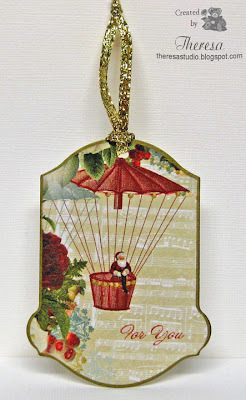 Tags are so much fun to make and quick to do, especially when you use these K&Company Layered Accents by Susan Winget that I used. I love Susan's designs and was happy that I found these cutouts that are layered and ready with pop ups to stick on. Using Spellbinder Label 4 Dies, I cut several pieces from Textured Red CS from stash and Authentique Pattern Paper from the "Wonder" pad. 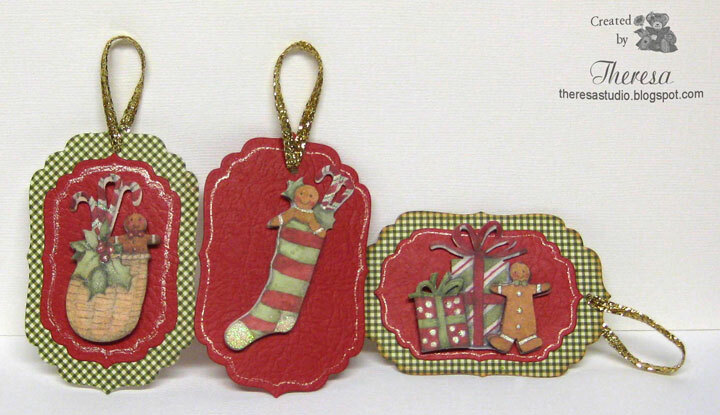 Made this group of tags with Gingerbread theme ( My sister will get these tags as she love Gingerbread Men ). Used Sakura Clear Star for highlights and Gold Metallic ribbons to finish. Back side stamped with old unknown stamp with Memento Rose Bud. Will make more of these tags for my gifts. Joan's Gardens Challenge: Make a tag. Anything goes. 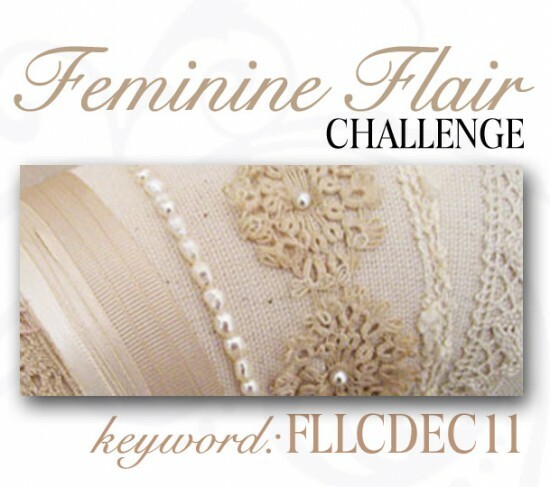 Crafty Ribbons Challenge: Make a Tag. Good Morning. 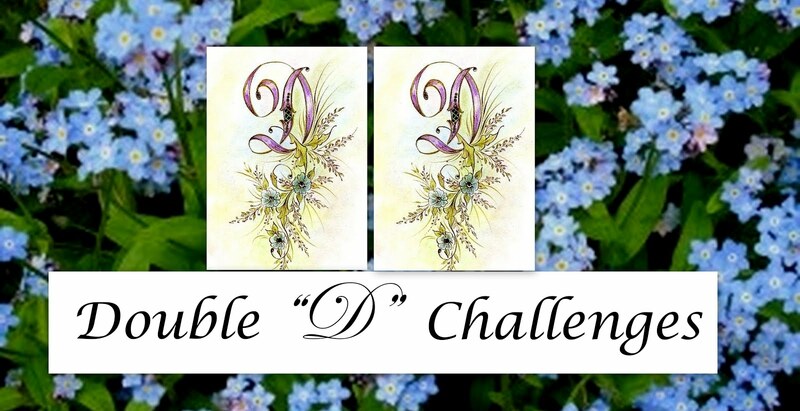 Taking some time out to make a tag for some challenges. I used paper from Webster's Pages "Waiting for Santa & Sweet Season" and cut out a section using Spellbinders Classic Keyhole Die that I attached to white CS for the back (used same die). I added some stickles to Santa and did some highlights with Sakura Clear star pen and Red Glaze pen. May have to enlarge to see. Stamped a sentiment from Flourishes "Doves and Holly" with Memento Rhubarb Stalk and stamped back with "To" and "From" from GKD. Edged Tag with Pilot Gold Marker. Finished with some metallic ribbon from stash to hang on package. Quick and simple tag but I liked the result. Using Webster's Pages Petite Paper that I won from Joan's Gardens that I save for special projects. Crafty Ribbons Challenges: Make a Tag. I am so excited...I am the guest designer for Timeless Tuesday for December 2011. When I was asked by Tammy Hershberger, the Flourishes Timeless Tuesday Challenge Coordinator, to be their Guest Designer, I was speechless and all I could say was WOW! I am so honored and excited to be a part of this prestigious and talented group of designers and of course, Flourishes is one of my favorite stamp makers. So, here I am as a guest designer for this month. 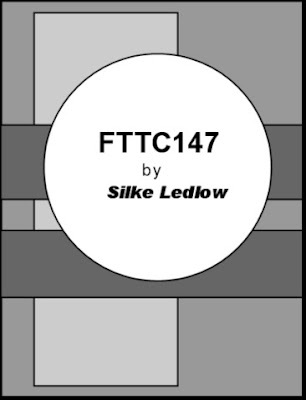 Silke is the hostess for FTTC147 and she has a sketch challenge shown below. Everyone can PLAY and anyone can WIN! Each week Flourishes draws one lucky name for a $10 gift code to the Flourishes store! 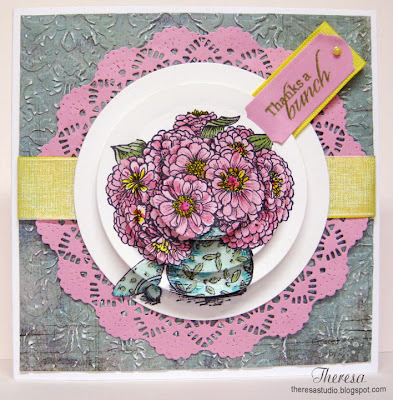 Check out all the details at the Flourishes Blog. For my card I decided to make a New Year's Card since I have finished my Christmas cards and I wanted to use a stamp set that I recently acquired, "Moments in Time" and thought it would be perfect for my card with a gold, black and white color combo. I stamped the clock face on Flourishes White Classic Card Stock using a Memento Tuxedo Black Marker. I used a marker instead of an ink pad in order to stamp only part of the clock...I eliminated the hands so I could make the clock strike "Midnight". I stamped the separate clock hands from the stamp set using versamark and gold embossing powder on a metallic gold card stock and cut them out. I used a gold brad to attach to the face. I finished the card using a metallic gold card base, a white embossed mat, a strip of black card stock embossed and sponged with gold ink, some layered ribbons, and a sentiment from "Paperwhites". Stamps: Flourishes " Moments in Time" and "Paperwhites"
I cannot believe that I did not use a single Copics! Thanks for dropping by. I enjoy all your comments. Thank you. The Timeless Tuesday Challenge at Flourishes is a Recipe Challenge from Cindy to include in your creation a flower, ribbon and a tag! I decided to use the Amaryllis Stamp from the set "A Year In Flowers 3". The Amaryllis is such a lovely flower for the holidays. I stamped the image in Memento Tuxedo Black on Flourishes Classic White CS and colored in Copics. 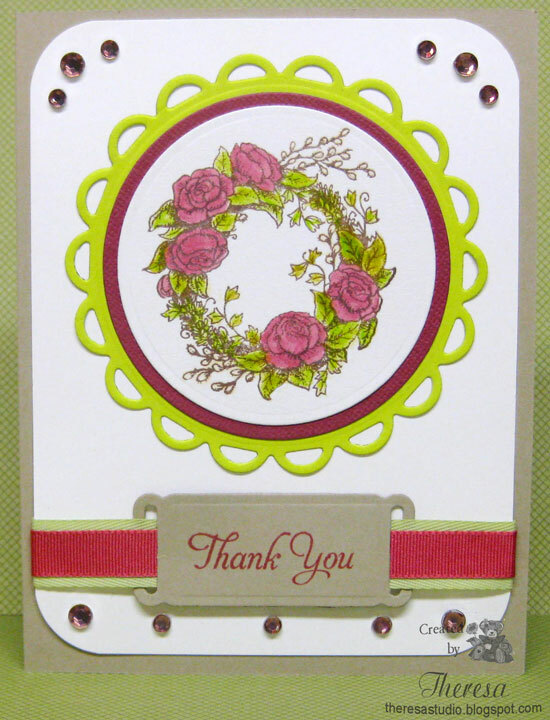 This was cut with Nesties circle die and placed on a Red CS Mat cut with Nesties Scalloped Circle die. I used a card base of the White CS with a Mat of Authentique Wonder Checked Paper. Befor adding the Satin Ribbon, I embossed it with Cuttlebug EF Divine Swirls for some texture. Finished with a tag stamped with sentiment from "Paperwhites" stamp set and a flower purchased by a member of my stamp club. I used a sketch from Our Creative Corner. 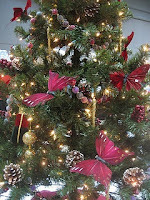 Our Creative Corner: "Haul Out the Holly...It's Time to Decorate!" Challenge. 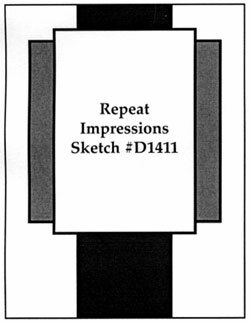 Use this very basic sketch, and "decorate" it! Sketch shown on left. I have all my Christmas cards ready to address and get in the mail but first I am trying to get my decorations finished. I always have a bad case of the But First disease at this time of the year. Do you ever suffer from that? Good morning. I have been away from Blogland for a few days and am trying to get back in the groove of making cards and posting for some challenges. I have missed visiting and commenting with my friends in cyberland. I have been traveling and visiting family and then busy with making some Christmas cards for my Mother, other family members, and of course for myself. I just had to take time to make this card with some new stamps from Mark's Finest Papers. I colored the Red-Breasted Nuthatch with Copics and Pencils, the cones with Copics, and the branches with Memento marker Bamboo Leaves after stamping with Memento Rich Cocoa. 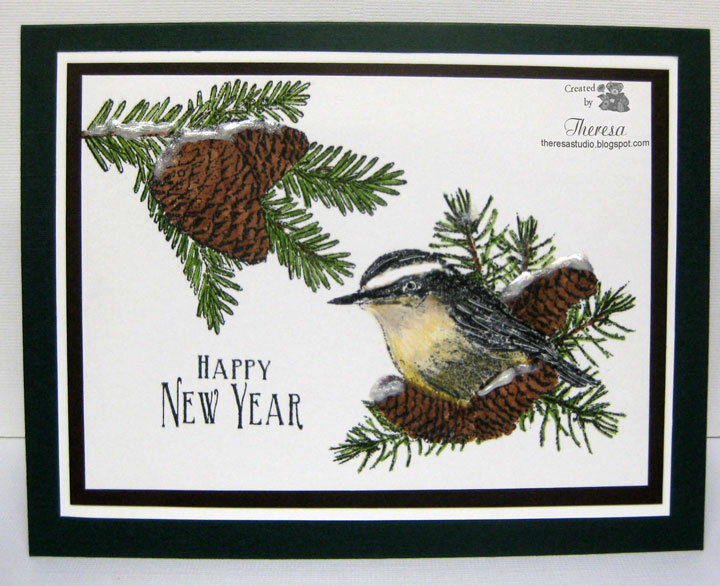 Stamps are from "Greetings of the Season" and "Mini Nuthatch". I love using outdoors scenes and birds in cards for men...seem to be more masculine in theme. Finished this with Dark Green Card Base and mats of White and Brown. Added some snow on cones and branches with Stickles. Tuesday Throwdown: Challenge is "a masculine holiday card." Glad to be back blogging. Now I must get my Christmas decorations out and in place. Why do I feel so behind? Thanks for stopping by. I enjoy all your comments. Thank you. PS: Check out some of my bears on the sidebar.